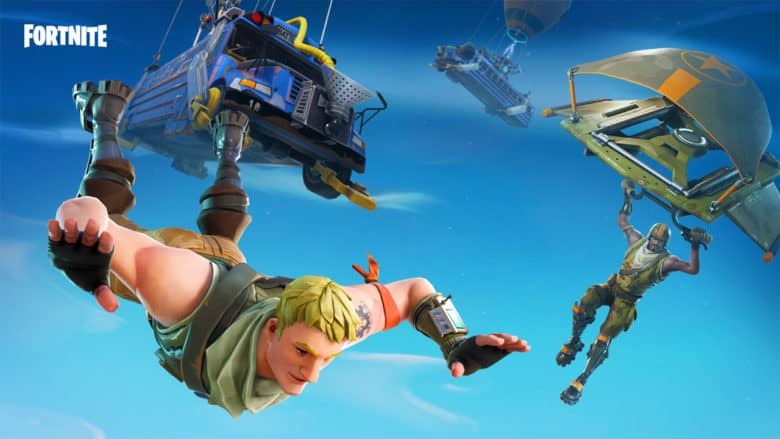 Fortnite’s latest list of challenges is live in Battle Royale. Here’s our guide to completing each one. Fortnite’s daily and weekly challenges are the best way to earn extra Battle Stars and level up your Battle Pass. Every tier offers players a new item, so you’ll want to try to reach tier 100 before the season ends to grab everything. We have some tips to help you collect all 50 Battle Stars this week. This is by far the easiest challenge this week because it requires very little effort. All you need to do is grab some materials — wood, metal, or stone — and build some structures. Every item you place uses 10 materials, so you’ll need to place just 25 in total. Almost everything you see in Battle Royale can be broken down for materials, including trees, buildings, vehicles, and rocks. Breaking big trees and pallets is a great way to pick up a lot of wood, while large rocks offer plenty of stone. You don’t have to complete this challenge in one match, so don’t worry if you’re eliminated halfway through. But if you’d rather get it out of the way in one go, land in a place like Wailing Woods or Lonely Lodge where it’s quiet and there’s plenty of trees. Grab 250 materials and build until you run out. This challenge won’t be too difficult to complete, but it is likely to take you some time. You’ll first need to locate a shopping cart or all terrain kart, then you’ll need to locate a flaming hoop before jumping through it. Here’s where you’ll find flaming hoops. The map above, courtesy of @TheSquatingDog, will help you find the latter. Shopping carts and ATKs can be found dotted all around the Battle Royale map — you just need to keep your eyes peeled while you’re on the move. You don’t need to jump through all five hoops in one match. You probably couldn’t even if you tried because the storm will make many of them inaccessible before you get a chance to visit more than one or two. So, you can take your time with this one. 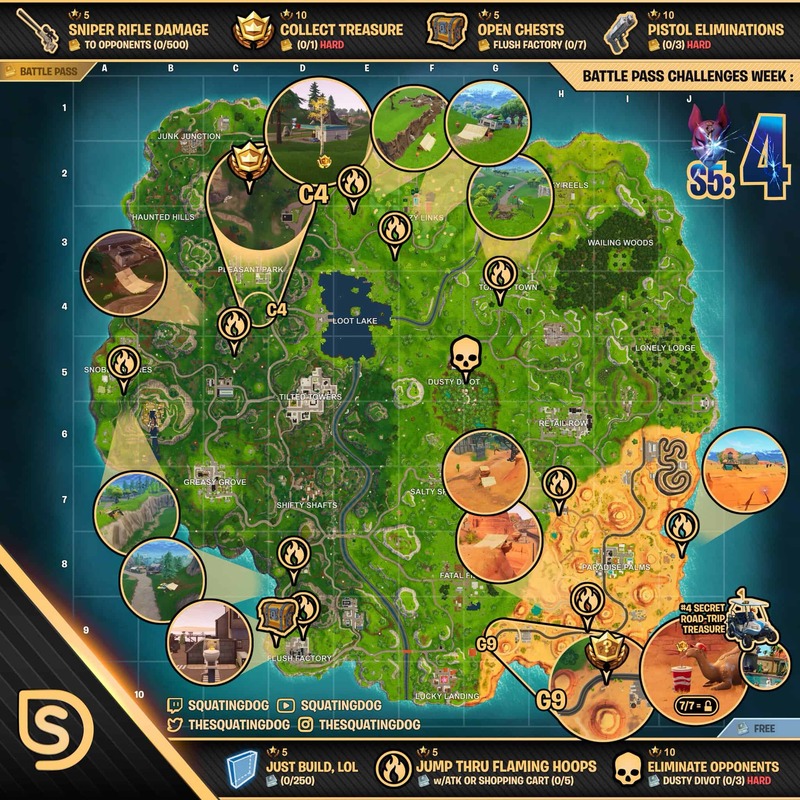 These challenges are great because they reward you with ten Battle Stars, and because thousands of other players are working to complete it, too, the location you need to visit always has plenty of opponents to wipe out. Land where you know you’ll find loot and grab a gun as quickly as possibly. Also apply some shields if you come across them and you have time. When you’re ready, find other players and eliminate them before they eliminate you. You don’t have to get all three kills in one match, so if you get eliminated, just return to Dusty Divot and try again until you’re done. If you struggle, wait a few days until others have completed this challenge and Dusty won’t be quite as busy. Sniper rifles are easy to find and they’re some of the most powerful weapons in Battle Royale, so dealing 500 damage with them shouldn’t take too long at all. All you need is fairly decent aim so that you can make sure you hit your target with them. To give yourself a better chance of hitting your shots, find some high ground and pick people off from above. Try to hit opponents while they’re still and you’re more likely be land your shot. Build cover around you so that you don’t get hit from behind or from the sides while you’re aiming. If your aim needs work, try to find a semi-automatic sniper rifle. You can fire up to ten rounds in between reloads — as opposed to just one — so if you don’t hit your target first time, you can quickly adjust your aim and fire again before they get a chance to protect themselves. If that doesn’t work and you’re still struggling, jump into a squad match with three other players. When you run into another team, fall back a little and build yourself some cover, then try to hit your opponents with the sniper while they’re busy fighting your teammates in front of you. Flush Factory has chest spawns all over the place, so searching seven of them shouldn’t be too tricky. You just need to know where to go. 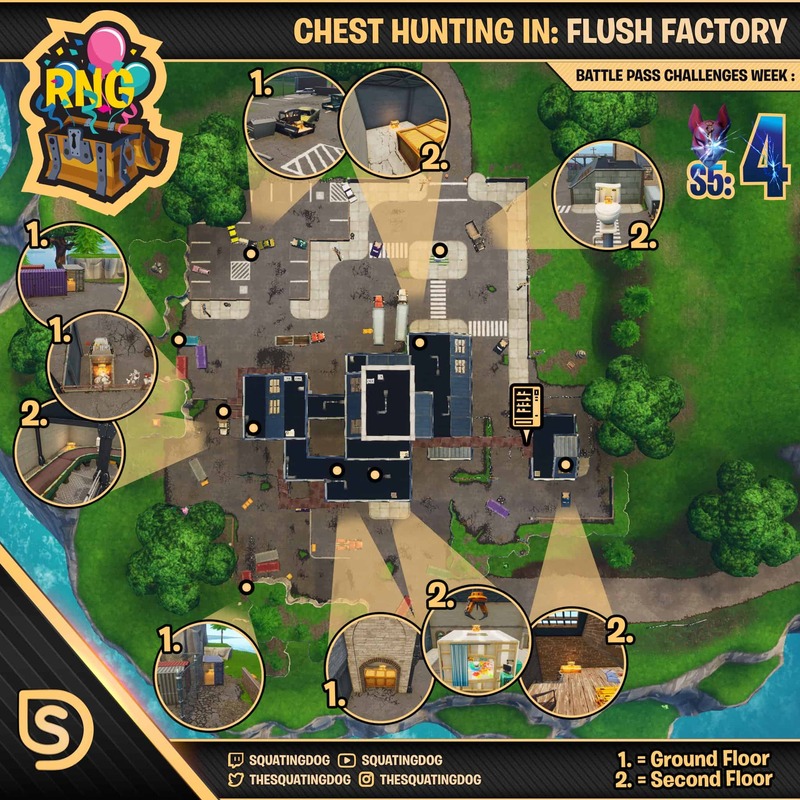 The map below, courtesy of @TheSquatingDog, will help you. Here’s where you’ll find chests in Flush Factory. If you find this challenge tricky because so many players are landing in the same spot, wait a few days until Flush Factory is a little quieter. These challenges are the easiest way to earn ten Battle Stars. All you need to do is visit the location where the stars are hidden and collect them. The map above — the same one that shows flaming hoop locations — shows you where you need to go. Look at square G9, near Paradise Palms. Most players rarely carry pistols because they can be tricky to use, and now that SMGs are much stronger, they’re not quite as effective in close-quarters gunfights. But they can still lethal if you use them properly. You might choose to try landing in busy areas, such as Tilted Towers or Salty Springs, and picking up a pistol as soon as possible before eliminating opponents who haven’t found a weapon yet — or anything too decent, at least. Alternatively, use a weapon you’re more comfortable with when first entering a gunfight and weaken your opponent with that, then switch to a pistol to finish them off. The silenced pistol is the most effective up-close, while the revolver and hand cannon are terrific at range if you have good aim. Aim for the head and as long as they have no shield, it’s a one-shot kill.